I'm going to be honest, it's been a long time since I've seen the 1941 Disney feature about a young circus elephant who is ridiculed for his big ears only to achieve his full potential through the encouragement of a mouse. That said, is it really any surprise we're getting alive action re-make of any Disney animated classic at this point? Hell, I wouldn't be surprised if we were to get a live-action Black Cauldron though I'd much prefer to see what someone might do with Oliver & Company or The Great Mouse Detective. Alas, as we have Tim Burton's Dumbo early next year along with Guy Ritchie's Aladdin in the summer followed by Jon Favreau's The Lion King a year from now and at least Niki Caro's Mulan in 2020 it seems I'll have to hope these endeavors continue to pan out if we're ever going to get deep enough in the well to see those re-makes come to life. While cautiously optimistic for Ritchie's take on Aladdin and all but busting at the seams to see a sneak peak at anything from Lion King I am most indifferent towards another Burton-esque take on this type of material as we all saw how Alice in Wonderland turned out. While that 2010 blockbuster more or less ignited this recent trend of re-imaginings for the modern age it was also a vastly different take on the material than the original, 1951 animated film. Over the course of nearly a decade these films have morphed into little more than replicates of the achievements in animation that came before them; see 2017's Beauty and the Beast if you need further proof. Still, there is sometimes fun to be had as both The Jungle Book and Cinderella were earnest enough to be enjoyable and though Burton hasn't exactly been on a hot streak as of late given it's been nearly a decade since he's produced an out and out critical success and even longer since he's produced both a critical and commercial hit, there is always that glimmer of hope each time out that we might get peak Burton. Why the auteur wanted to take on Dumbo I'm not sure, I told you I haven't seen it in a while, but if there is anything to be taken from this new trailer it is the fact Burton still has a knack for fantastic imagery as the time period and setting seem to play a large role in the lives of these characters and the overall tone of the film. How the film will update and hopefully improve upon the original remains to be seen, of course, but at least we can count of the film looking magnificent on the big screen. 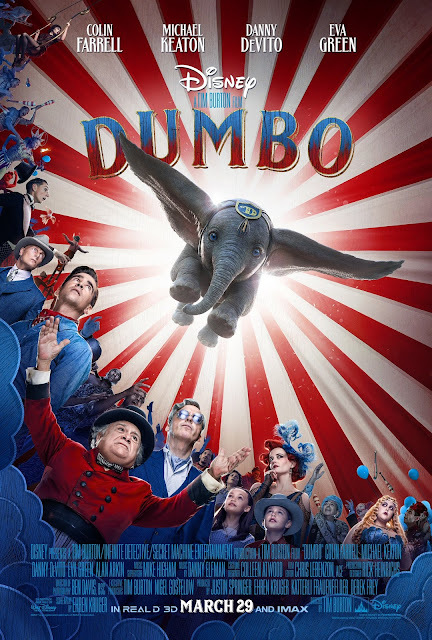 Dumbo stars Colin Farrell, Danny DeVito, Michael Keaton, Eva Green, Alan Arkin, Finley Hobbins, Nico Parker, and opens on March 29th , 2019.